RIVOPS is compatible with Codesys OPC Classic (AE, DA, HDA) Server as well as OPC-UA Servers - release 3.5.12.0. We are pleased to have been introduced to 3S - Codesys products by Motorola Solutions, Berghof Automation and Wago PLCs and committed to the delivery of 3D overview panels using those PLC technologies as foundation for our 3DSCADA products. How to display safety critical information without overwhelming the operators? At the age of digitalization, software automation engineers have a stronger responsibility to NOT implement front-ends that are overwhelming for the operators. "An alarm message can be seen as a short telegram sent to the operator to inform him of a fault". Such a message should be - as compact - as visual - as clear - as intelligent - as possible. RIVOPS is an alarm page for the control room. It shall grasp the attention of the operator for just a few seconds (<3s) and send its telegram message across the HMI displays of the control room. RIVOPS is nothing else than a smart OPC Alarm Client, it renders a dynamic representation for each fault scenario. That image is computed in real-time for any given alarm list. It contains an alarm banner compliant with the #OPCUA, #EMUA191, ISA 18.2 specifications. For those who believe that showing an image tells more than a hundred words, follow that link. EATOPS builds control rooms equipped with an Alarm Summary overlaying Alarm Banners on the top of a 3D representation of the plant. The RIVOPS technology is able to display an OPC Alarm Message from an automatic-fault-scenario function running on the PLC. (compatible with #Siemens 400, 1200 and 1500 series). EATOPS is commissioned to deliver a control room for small underwater drone operations using the 4G network. Our roadmap include early testing using the MavLink protocol, OPCUA high performance implementation and DDS. The Swisscube mission is known for the being the first Swiss spacecraft mission. EATOPS joined that effort and operated the spacecraft from the Noordwijk CubeSat ground station (KD2AMA) facility. Writing an ESD control philosophy for the Liza-1 field development project (ExxonMobil). EATOPS wishes you a happy new year 2018! Whereas the Industry is facing a digitalisation of its plants, EATOPS makes use of scripting languages to produce a robust PLC logic and build virtual piplines that control physical parts. The code is consistent across multiple installations and highly reliable thus produce by a script rather than a human hand which could make mistakes. 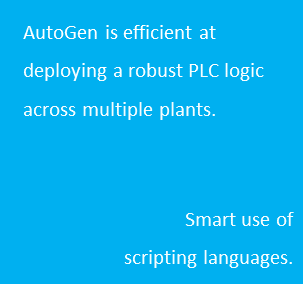 AutoGen serves an even broader ambition at embedding articifical intelligence ruling into the PLC code and publishing industrial OPC UA data over the internet (IIOT). Meet us at the OTD industrial fair in Stavanger on Oct 17-18th 2017. Augmented reality, mixed reality, are you ready? 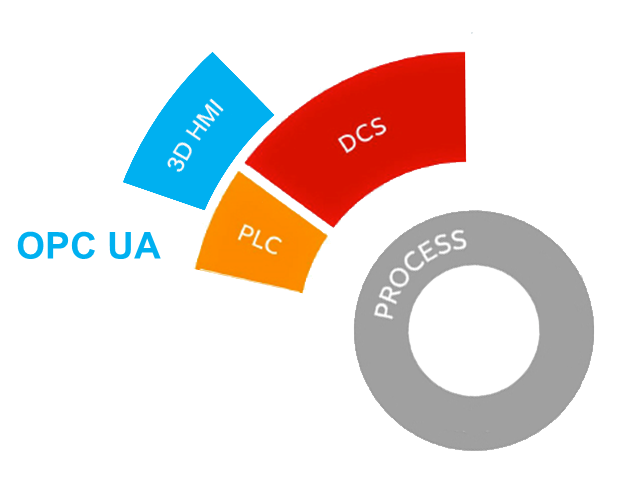 Meeting OPC UA specifications using the detangled box. 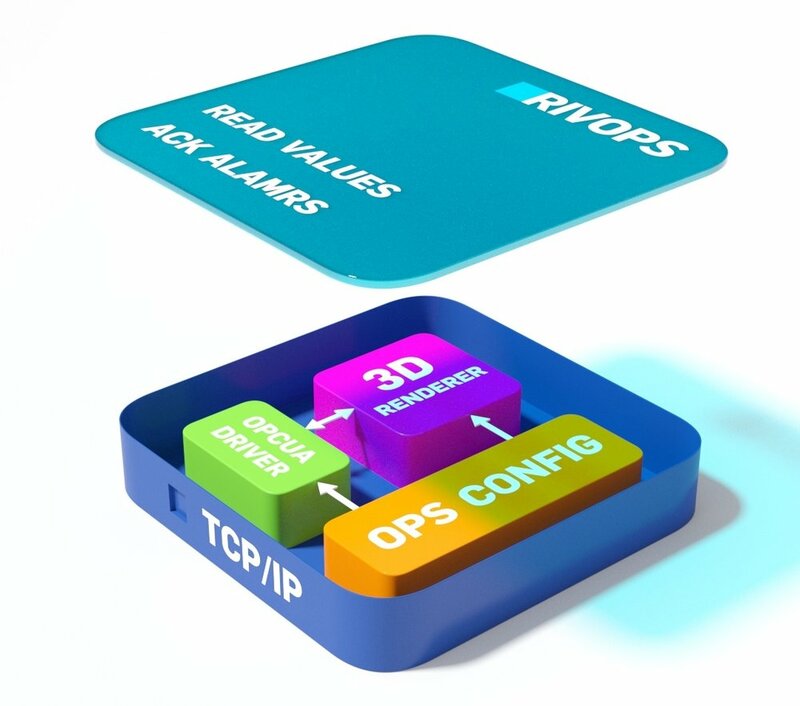 RIVOPS complies with the OPCUA unified architecture DA specifications. Maritime class certification for SAS systems in the North Sea sector. This is a full PLC to HMI control panel assembly. EATOPS releases a control system which involves a digital radio-link, a Codesys PLC, a RIVOPS 3D HMI panel and an OPC AE Server/Client architecture. The alarm banner is ISA 18.2 compliant according to the EEMUA191 3rd edition guideline. EATOPS will give a presentation in Stavanger (N) on automatic code generation for onboard control systems. More on Spaceport Norway web portal. Automatic code generation unlocks a whole new range of control software features such as: fault scenario recognition and dynamic alarm grouping (ISA 18.2, EEMUA 191). Embedded code generation is fundamentally changing the way engineers work. Instead of writing thousands of lines of code by hand, engineers are automatically generating their production code to increase productivity, improve quality, and foster innovation. EATOPS uses an excel definition of the equipment list to automatically generate the source-code of the control panel most time-consuming components. How should the captain of a ship decide to trigger an evacuation? How should a driller onboard an offshore vessel decide to pull-out and immediately disconnect from the well? How should a control room lead operator re-evaluate his initial risk assessment and prepare for a corrective action? EATOPS' Alarms & Events plug-in means a lot to operators. This OPC AE strict implementation considerably improves the judgment of an operator. The RIVOPS console benefits from this extra comfort. It gives the presentation layer of the control room a cleaner overview thus an increased awareness of the system being monitored. The OPC AE standard is fully compliant with ISA 18.2 which promotes the use of process alarm messages and alarm attributes for the operator. An good example of that is the RIVOPS' 3D SCADA approach which naturally drives the operator attention over the areas of a process when the needed thresholds are met such as during an event detection, or an abnormal scenario detection with its pieces of equipment’s safety limits. The RIVOPS alarm-banner is mostly suited to identify the location of faulty equipment, or create awareness on the time to response before a corrective action should be taken. The operator's understanding of the severity of a scenario is improved through a colour-coded interface which is directly inherited from the OPC AE Server attributes. Instead of making its own interpretation of the severity, the HMI is brought back to its slave position receiving its information messages directly from the alarm server. This is very positive in the sense that the alarm server is now entitled to fully play is role of server dispatching a unique message to the family of HMI displays found in the control room. Another advantage is that the operators' acknowledgment messages are aggregated inside the alarm server & directly transmitted to the PLC where the process logic is running. Unlike too many HMI packages, this alarm information is not stored inside the HMI Runtime. Such a software architecture avoids a lots of inconsistencies in the control system. It pushes the artificial intelligence capabilities to another level. For more information on the RIVOPS overview panel, please visit our technology section. EATOPS wishes you a happy new year 2017. The Swisscube mission is known for the being the first Swiss spacecraft mission. EATOPS joined that effort and operated the spacecraft from its Noordwijk CubeSat ground station (KD2AMA) facility. The com system is based on a AX.25 protocol. The telecommands are encapsulated into the CCSDS PUS format. Picture of the Earth's surface (left), Sun (Center), Light reflection (right) using a 1200 bps downlink via UHF.